After a farmer or a gardener plants their crops they have to wait to see what, if anything is going to grow or bloom. I planted six new roses in the backyard. They all came from the same reparable rose seller that I’ve used for years. I have several roses from this same place that are over 15 years old so I know the roses are of good quality. I planted them at the same time, in the same area and at the right time of the season but, only two out of the six am showing signs of life. I don’t know what could have gone wrong! What if the four die? I will have wasted my time, great effort and energy plus the money I paid for them. Plus, I’ll want four more roses to replace them. I am worry about the possible loss of the four roses. Yesterday, I was on my way back to look at the four roses again to see if there was ANY sign of life when a thought struck me; with all my worrying I couldn’t make the roses live! I could worry and fret over the four dead looking roses but I don’t have the power to make them live; only God has the power of life and death. So, why am I worrying and wasting my time and emotions on something I had no control over? Because I wanted the roses to live! My want for something I had no control over drove me into worry and waste while I tried to figure out how I could get what I want. Have you ever been there? Maybe you’re there right now. Maybe you want something so bad that you have forgotten who is the Source and Giver of all things. Maybe you are so concerned about finances, a wayward child, or the loss of a job or the closing of a family business. It doesn’t matter what you’re worried about; this is just a reminder to never forget God, who has controls everything and everyone. It is easy for lose focus on the Giver when you are only looking at the gift. 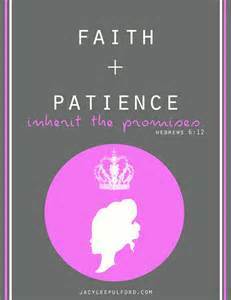 Patience combats worry. God knows what we need even before we need it and puts everything in order to meet us at our point of need. We must stay focused on Him and be patient, not worry or fret ourselves over things that we want but may not need and not waste our time trying to get things God hasn’t ordained for us. With patience there is no worry. With trust there is no waste. With obedience there is no want. Therefore; combat worry, waste and want by patiently trusting God while you obey His commands for your life.